A hilarious gift book to help Remainers cope in the run-up to the fateful Brexit moment. 'So long, farewell, auf Wiedersehen, good nightI hate to go and leave this pretty sightSo long, farewell, auf Wiedersehen, adieuAdieu, adieu, to EU and EU and EU'So sing the 16,141,241 of us who voted Remain on 23 June 2016 as we career head first into the oncoming traffic of independence from the EU sometime soon. March 2019 is the cursory date for exit and the story of Brexit will continue to rumble on, as will disgruntled Remainers and smug Leavers. 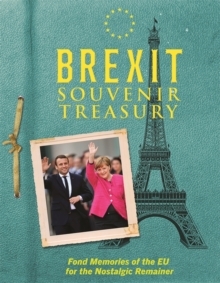 The Brexit Souvenir Treasury will take you back to the Good Old Days where GBP100 would get you EURO145, enough to get to Calais and back with four cases of wine and still have enough left over for a croque-monsieur and a cafe au lait. With activities and fun games aplenty, with this old-school treasury you can put on your blue-and-yellow-tinted glasses and lose yourself in the warm glow of the European dream for at least the next 30 years, after which another EU referendum might give us the opportunity to return to the European fold. Features:- Collectable Brexit Cigarette Cards: Get the lowdown on all the big-hitting Brexit superstars- Cut-out-and-keep Remainer bunting- Now That's What I Call Brexit classic playlists- Dreamy Macron posterand much, much more.